Croissants are a symbol of dietary decadence. However, as the French have taught us, it is possible to eat a croissant now and then without weight gain or other adverse effects, according to Cornell University's Food and Brand Lab. 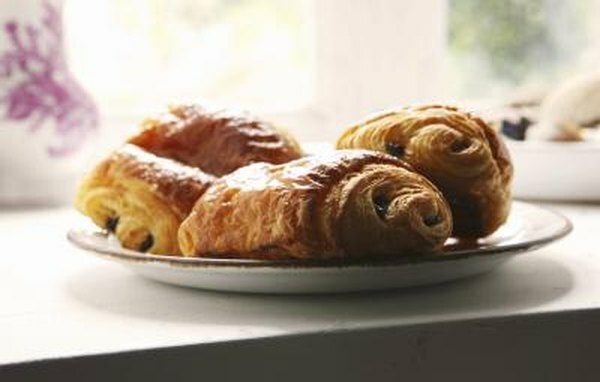 Croissants are high in fat, and contain plenty of refined carbohydrates, which is why they should be regarded as an occasional treat. Knowing the nutritional facts about croissants can help you make an educated choice about how often to include them in your diet. Early croissants were made of almond meal and sugar, and might have originated in Budapest, Hungary. However, the flaky pastry that we now associate with the word did not come into existence until the cookbook “Nouvelle Encyclopedie Culinaire” was published in 1906. Croissants were first popular in France, and have become popular in other nations as well. You can buy croissants in almost any mainstream bakery in the United States, including supermarket bakeries. A medium butter croissant is approximately 2 oz. and contains 231 calories. 108 calories in a croissant come from fat. Much of the fat in a croissant is saturated fat. A medium butter croissant contains almost 7 g of saturated fat, according to the U.S. Department of Agriculture's Nutrient Data Laboratory. According to the American Heart Association, you should limit your intake of saturated fat to 7 percent of your overall calories. If you're on a low-carb diet, you'll want to avoid croissants. One medium butter croissant contains more than 26 g of carbohydrates. The types of carbohydrates in a croissant are refined carbohydrates. Unlike whole grains, refined carbohydrates are not protective against heart disease, diabetes and other diseases, according to the Linus Pauling Institute. Foods made with refined flour do not contain as much fiber as foods prepared using whole grains. Croissants do not provide much protein for the calories. One medium croissant contains 1.5 g of protein. Croissants are low in vitamins and minerals.Most of the vitamins and minerals that they do contain come from the enriched white flour from which croissants are made. A medium croissant contains 20 mg of calcium. This calcium comes from the butter used in its preparation. Croissants contain small amounts of most major nutrients, including many of the B vitamins. You can increase your nutrient intake when you eat a croissant by eating it with fruit or a nutritious sandwich filling. When faced with a choice between croissants and other baked goods, select an item that includes whole grains. Whole grains provide fiber and additional vitamins. Watch portion size, however, as a large whole grain muffin made with plenty of added shortening and sugar can have double the calories of a croissant. As an alternative to a croissant, choose whole grain toast, oatmeal or half of a whole-wheat muffin with low-fat cream cheese. If you bake your own croissants at home, consider replacing the butter in the croissant with non-hydrogenated tub margarine. While this will not save on calories, it will reduce the amount of saturated fat in the croissants. If you do so, read the list of ingredients to ensure that the margarine does not contain water because tub margarine with added water is not appropriate for baking.